Passport on sale now at U.S. Honda dealers. The new Pilot-derived 2-row midsize crossover from Honda aims to appeal to body-on-frame midsize SUV owners thanks to its off-roading abilities. MOAB, UT – Arriving at the same time as the reborn Chevy Blazer is the reborn Honda Passport. Like the Blazer, this Passport CUV is bigger than the old Passport SUV, sold from 1993 to 2002. It also gives a nod to the old Passport’s off-road prowess. The new 2-row Passport midsize CUV, based on Honda’s light-truck platform underpinning the Ridgeline pickup and 3-row Pilot CUV, aims to capture those who seek adventure (or want to seek adventure) and likely don’t need a third row. Available with front- or all-wheel drive, the new CUV is powered by the Pilot’s 3.5L SOHC V-6 with i-VTEC and direct injection. The V-6 in the Passport makes 280 hp at 6,000 rpm and 262 lb.-ft. (355 Nm) at 4,700 rpm, the same specs as in the Pilot. 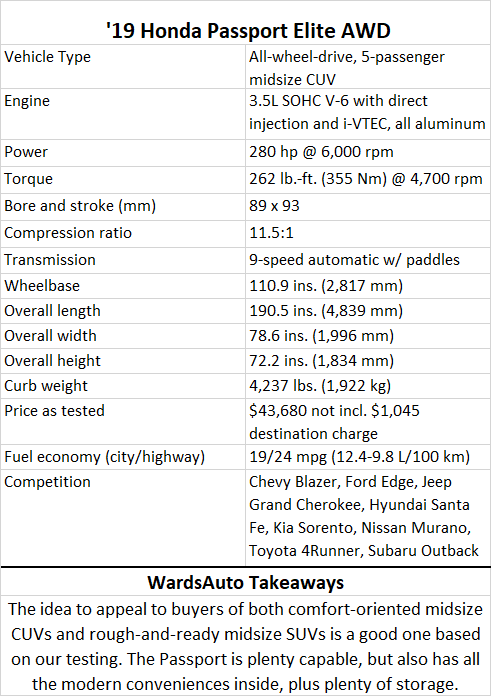 Among benchmarked midsize CUV or SUV competitors, those figures top Nissan’s VQ 3.5L V-6 in the Murano, while the Honda V-6 has more horsepower than the Ford Edge’s 250-hp 2.0L turbocharged I-4 but is shy of its 275 lb.-ft. (373 Nm) of torque arriving at 3,000 rpm. Besides the Edge and Murano, Honda also sees the Jeep Grand Cherokee and Toyota 4Runner body-on-frame SUVs as competition. Against those models’ V-6s, the Passport falls a little shy on horsepower and tops the Grand Cherokee, but not the 4Runner, on torque. Despite its relatively high torque peak, the Passport V-6 almost always moves quickly under medium or heavy throttle input. The exception here is using mud mode in sloppy off-road areas, which delays forward momentum as torque is sent rearward to gain traction. The Passport uses a second-generation version of ZF’s 9-speed automatic, updated with smoother, less noticeable shifts than earlier versions in Honda light trucks. American Honda officials say having a vehicle that can off-road is a big selling point to people who have no intention of actually doing it. But should you want to weave through rocky terrain, ford a river or go mudding, the Passport is perfectly capable based on our experiences of doing all that here. With more ground clearance than the Pilot or FWD Passport, and generous approach, departure and breakover angles, our top-of-the-line Elite AWD grade never gets hung up as we off-road for about 20 miles (32 km) near Arches National Park. There are multiple terrain drive modes, but barring a quick use of mud mode most modes stay off during our testing as conditions are fairly dry with little mud, sand or snow to power through. As in the Pilot, Honda’s torque-vectoring AWD is able to send up to 70% of engine torque to the rear and apportion up to 100% side-to-side between the rear tires, a big factor in getting us easily over tough terrain. Steering is nicely weighted. The electric power-assisted rack-and-pinion system is shared with the Pilot, but the Passport has a slightly faster steering ratio for more agile handling. The curve-tracing, motion-adaptive aspect of the Passport’s EPS, wherein steering is initiated to “prompt the driver to steer in the correct direction” while cornering or on slippery surfaces, takes some getting used to. We feel it frequently as few roads around Moab are straight. Due to all the off-roading, our fuel economy over the morning drive is an unremarkable 18 mpg (13.0 L/100 km), but in the afternoon with no off-roading we approach the Elite AWD’s estimated average of 21 mpg (11.2 L/100 km). The Passport is dark and brooding due to its blacked-out glossy grille, giving it a different look than the family-oriented Pilot and a way to give it an “urban” look, too. The all-black interior in our Elite AWD test vehicle is bland, despite piano-black trim inside. We’d love to see some color, such as red accents like those in the new Blazer’s RS grade, to spice up the space. The sliding cover of the center-console bin has a fun striated black-and-gray look, presumably to make dust and dirt less noticeable. Rear legroom is generous for this 5-ft.-8 reviewer and is among the highest in the midsize CUV segment. Thanks to no third row or front trailing arm, there is a cavernous underfloor cargo area in the Passport, although we wrestle with the large floor cover to access the smaller storage bin adjacent to the spare tire. The big “everyday” bin is easier to get at as the floor cover has a crease directly above it for folding. Our test vehicle has good fit-and-finish, except for some misaligned hard-plastic trim on the back of the center console. The Passport has Honda’s new-ish and user-friendly infotainment system, with rearrangeable app tiles and near-natural-language voice recognition. Spoken commands to change the satellite radio station are understood and quickly performed, while asking the navigation system to “find the nearest Starbucks” is a longer process due to three menu steps. The prevalence of dirt and winding roads, and a lack of traffic to follow, give us little ability to test the Passport’s adaptive cruise control and lane-keep assist functions, both standard across all grades as part of Honda’s Sensing advanced driver-assistance safety technology suite. The CUV starts at $31,990, not including a $1,045 destination and handling charge, putting it on par with the SEL grade of the ’19 Ford Edge (the Passport lacks a base grade equivalent to the Edge’s SE) and the entry-level ’19 Grand Cherokee, and a bit below the $34,400 Murano SV. The Passport’s also priced below the ’19 4Runner ($37,000). Honda’s plan to appeal to two groups, those looking for a comfortable on-road CUV and a capable off-road SUV, is well executed based on our testing. Time will tell if buyers agree. Honda is mum on sales potential, but Wards Intelligence forecasts the Passport to sell roughly 50,000-70,000 units annually in the U.S., respectable numbers but below the 80,000-plus Edges and Muranos sold last year. The new Passport is assembled at Honda’s Lincoln, AL, plant and is on sale now at U.S. dealers.